We are in the home stretch with the 31 day challenge with less than a week to go! It's been a tough slog this year for me, and getting sick really through me off. I still managed to get my manis done, but some may be lacking in creativity. Today's prompt is inspired by fashion, and I was inspired by a pair of shoes I saw on instagram. Sadly the post didn't credit where they are from or what brand they are, so if you know I'd love you to tell me, as I would love this pair of shoes! My mani was created using a single coat of Emily de Molly, Cracks in the Walls. I left it at one coat because I wanted a sheer look behind the striping tape, as the show only has a fine mesh. I then applied the striping tape starting with the middle fingers and working outwards. 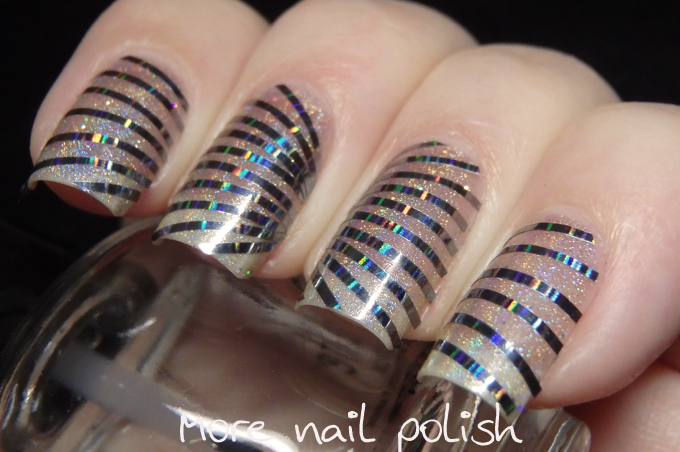 The effect was really cool, and I think the holo lines in the striping tape really set the design off. 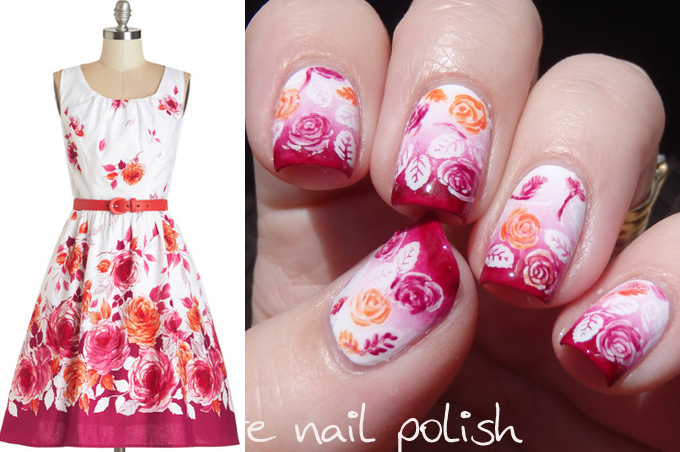 My inspired by fashion nails from 2013 and 2014! Jimmy Choo Hologram Black Multicolor Patent Peep Toe Bootie! LOL. I loved these instantly when I saw them on pinterest. I would never be able to afford them but I love the look. If you are able to get your hands on a pair please post a pic so I can live vicariously. Excellent, you know your shoes! But of course they had to be a $500 pair! I don't think they are in my budget either! Luckily my obsession is only little bottle of polish and not shoes! 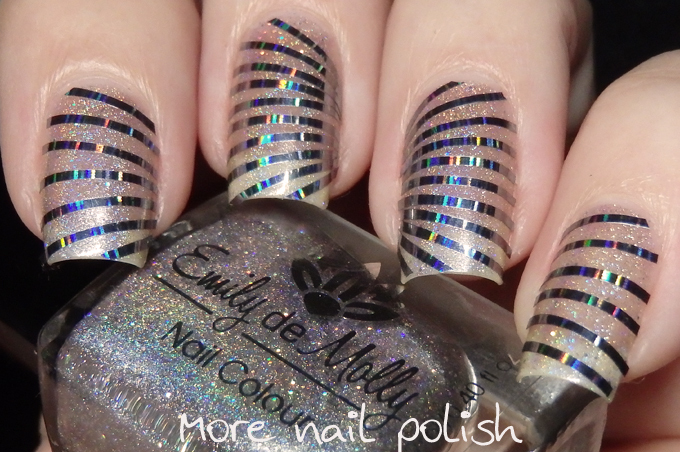 These nails are just AWESOME! You must have the patience of a saint, lol. I've just started looking at various nail art blogs and starting my own to keep track of what I've done and you've inspired me to (soon) start my own rendition of the 31 Day Challenge. But first, my obsessive brain has stuck me with fine tuning some organization things regarding my polishes, so once I am caught up, I can begin. Or maybe I'll make a deal with Brain and still start next month ;-) Thank you for inspiring. These are so beautiful and those shoes are just wow! These are so beautiful and the shoes are just wow! !